The privately organised rugby team was the first to wear the silver fern and an all-black uniform. 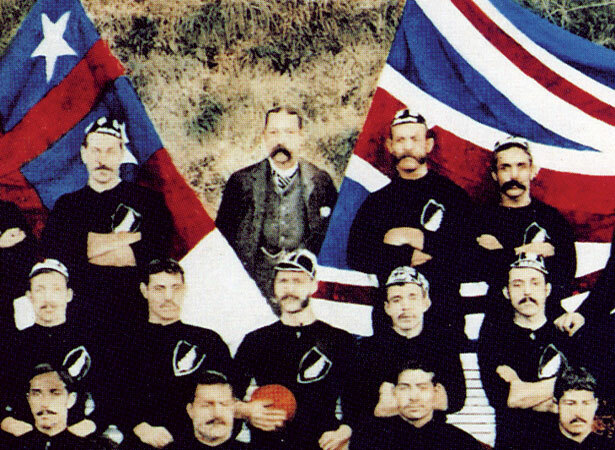 Originally called New Zealand Maori, their name was changed after organiser and captain Joe Warbrick (Ngāti Rangitihi) and promoter Thomas Eyton added five Pākehā to strengthen the team. The 26-man squad included six former students of Te Aute College, five Warbrick brothers, and future All Black captain Thomas Ellison. During a marathon 15-month tour of New Zealand, Australia and the United Kingdom, the Natives played 107 rugby matches – winning 78 – and another 11 under Australian rules. The team disembarked in London on 27 September after a six-week voyage from Australia. Six days later, they efficiently defeated a scratch Surrey XV 4–1. The enterprise had echoes of the Aboriginal cricket tour of 1868, but apart from performing haka before matches the Māori proved relatively unexotic. They beat Ireland, but lost to Wales and England as fatigue set in. The main legacies of the tour were Ellison’s invention of the disruptive wing forward position and the adoption of more structured back play. We have 19 biographies, 7 articles, related to New Zealand Natives team plays first game in UK.